This Creamy Chicken Enchilada Casserole is a crowd pleaser that is as loved by kids as it is adults! 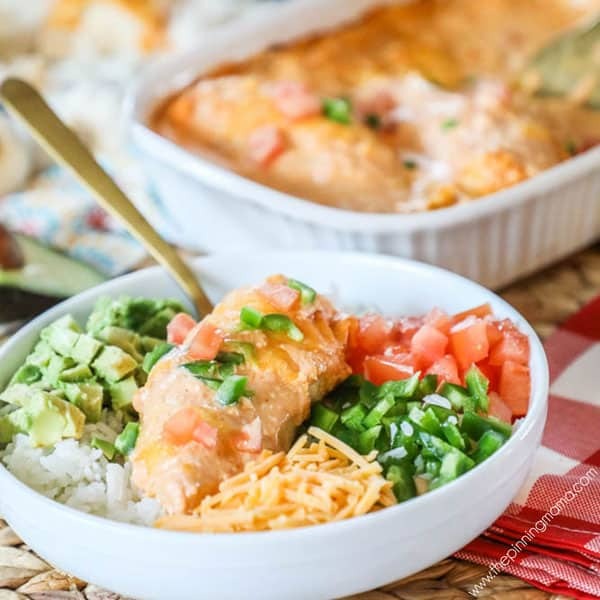 This easy dinner has all the delicious flavors of creamy chicken enchiladas baked right into a casserole. You can serve it with your favorite Mexican side dishes like tortillas, rice and beans, or keep it lighter by serving it over cauliflower rice or greens. As a bonus, since it is made in just one dish, there is minimal clean up too! Now that is my kind of dinner! Make sure and check out all the serving suggestions and ideas for leftovers below! The other thing that making this dish casserole style does is allows you to go tortilla-less! That means if you love the tortillas, you can still serve them right on top of one, but if you are wanting to eat low carb or need a gluten free option, you can still get all the enchilada goodness without the tortillas. Or if you are like me, you have one kid who likes tortillas, one who doesn’t. One who’s favorite food is rice and one who won’t touch it. Making Chicken Enchilada casserole lets you whip up the main part of the meal quickly and then each picky kiddo can pick how they want to eat their serving. Chips- My husband likes to crunch up tortilla chips and eat it with them. Pasta- There is plenty of sauce in this dish to spoon right over pasta! For more easy low carb chicken dinners, try my baked garlic chicken, green chile chicken, or fajita chicken bake! Make sure to find the full printable recipe card and nutrition information below. Here I will walk through a few frequently asked questions and tips for making this recipe so that if anything comes up as you cook, hopefully we can get it answered quickly! If you don’t find the answer here, feel free to leave me a note in the comments and I will try to get back to you as soon as I can! Q: Can I cut the chicken smaller or use other cuts of meat? A: Absolutely! You can use full breasts, but I generally at least cut them in half so that they are half the thickness which will help the dish cook more quickly and keep the chicken tender. You can also cut the chicken into chunks or use chicken tenderloins to make this casserole easier to serve and cook more quickly. If you prefer other cuts of chicken like chicken thighs those can also be used. I would recommend buying boneless and adjusting the cooking time appropriately. Q: Can I use low fat or fat free cream cheese or sour cream? A: I find that low fat cream cheese and sour cream does work in this recipe but fat free does not tend to soften or melt in the same way so I do not recommend using it. Q: Do I cover this while baking? A: I bake my casserole uncovered. I like the cheese to have a little crispness to it to add texture to the dish and I like the extra juices that are released to have a chance to evaporate out of the dish rather than collecting inside it. That said, if you want really gooey, stringy, cheesy goodness, you can either cook the dish covered and just uncover for the last 5 minutes or so, OR, you can leave the cheese off and bake uncovered, then just add the cheese the last few minutes of baking for it to melt. Q: Can I use a bigger/smaller casserole dish? A: You can really use any size you want, as long as it fits. The size of the casserole dish you use will impact the baking time. If the chicken is too tight in the dish it will take longer. If it is spread out farther it will cook a little faster, so just keep an eye on it. 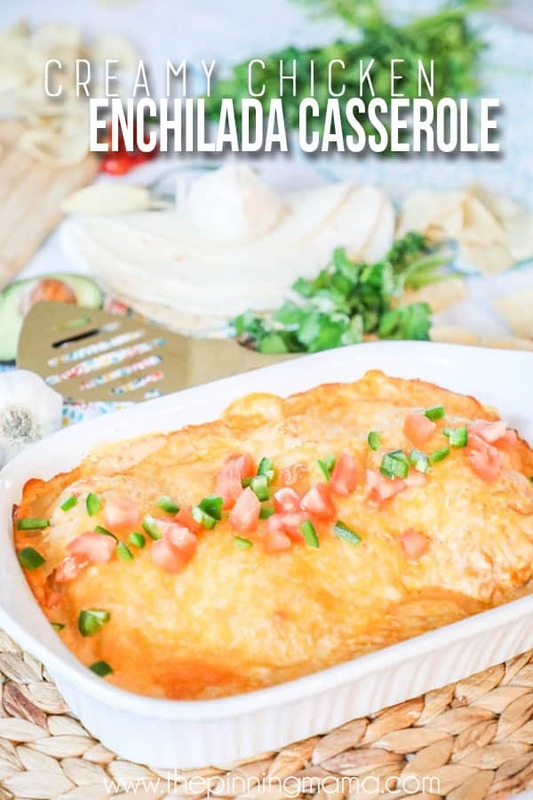 A: This Chicken Enchilada Casserole can easily be made gluten free by ensuring the enchilada sauce is gluten free as some aren’t and some are. It is also smart to check any other prepackaged ingredients as well, but cheese and sour cream is generally gluten free. Q: My sauce is too thin. What did I do? A: When chicken bakes it releases juices that will mix into the sauce. If your sauce appears thin, make sure to mix it and also let it rest for a few minutes. When the sauce is piping hot it will be thinner and as it cools it will thicken. Chicken Enchilada Casserole – Leftover Ideas! If you find yourself with leftovers after serving this yummy casserole, don’t throw them out or eat them again the same way! There are several ways to give them a little “makeover” and turn them into a new meal. Here are some of my favorites! Shredded Chicken tacos– Shred the leftover chicken and mix it into the sauce. Serve it as tacos or on nachos. Enchilada Grain bowls (pictured below)- Fix a bowl of rice, quinoa, farro etc, place a chicken breast on top along with your favorite veggies and a scoop of sauce and enjoy! Enchilada Pie- Chop up leftover chicken and mix with sauce. Spoon the mixture over prepared corn bread and top with an extra sprinkle of cheese then broil on low until the cheese is melted. Enjoy! Enchilada stuffed baked potatoes– Chop up the leftovers and stuff them inside a tender baked potato! Top with sour cream, onions, and cilantro! Quesadillas– Throw this chicken with some of your favorite veggies and a little cheese in to a tortilla and grill on each side until golden. I hope you get a chance to enjoy this delicious dinner and even try a couple of the leftover ideas! 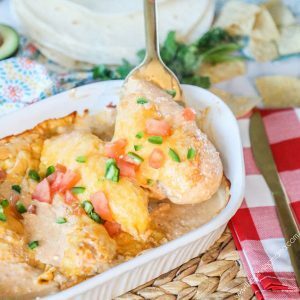 This Creamy Chicken Enchilada Casserole is everything you love about delicious Chicken Enchiladas in a super simple to make casserole dish! It is a crowd pleaser and can be served with an array of sides perfect to meet special taste preferences and dietary needs. The best part is the easy clean up at the end! Mix softened enchilada sauce, cream cheese, and sour cream together until smooth. Place chicken breast flat in the casserole dish pour the sauce mixture over the chicken. Sprinkle the cheese evenly over the top. Bake uncovered at 375˚F for 30-40 minutes or until the chicken is 165˚F internal temperature. Remove from oven and let set for 5-10 minutes, then top with desired toppings and serve warm. You can cut the chicken in half, chunks, or use chicken tenderloins in lieu of full chicken breasts to make serving easier and cooking quicker. Cooking time may be reduced and will depend on the size and thickness of the chicken. To ensure this recipe is gluten free, make sure to buy gluten free enchilada sauce and double check all ingredients. This looks amazingly delicious. Thanks for sharing. Will be making this dish. Can you make this in a crockpot instead? Update! I made mine in the crockpot and it came out delicious! I seasoned my chicken and dumped a can of diced tomatoes on top. Let that cook for about 5-7 hours on low. Drain the juices then put the mixture on top and let it cook for another 30 min to an hour on high. Then put it in the oven under the broiler until the cheese browns.